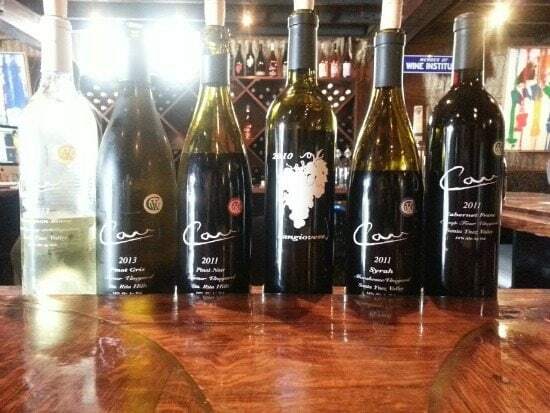 There’s something about walking into a winery, and smelling the magic of wine being produced. It’s sweet and lingering, subtle and tantalizing. 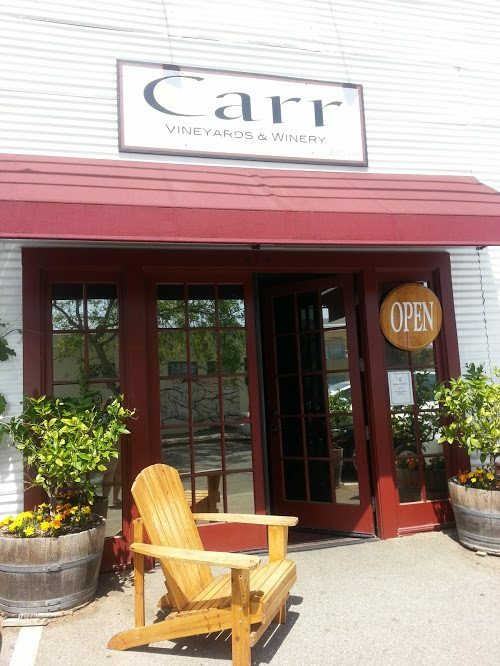 For a wine blogger stuck in a car for several hours, entering into this aroma at Carr Vineyard and Winery was beyond brilliant. Even remembering this moment makes me smile. 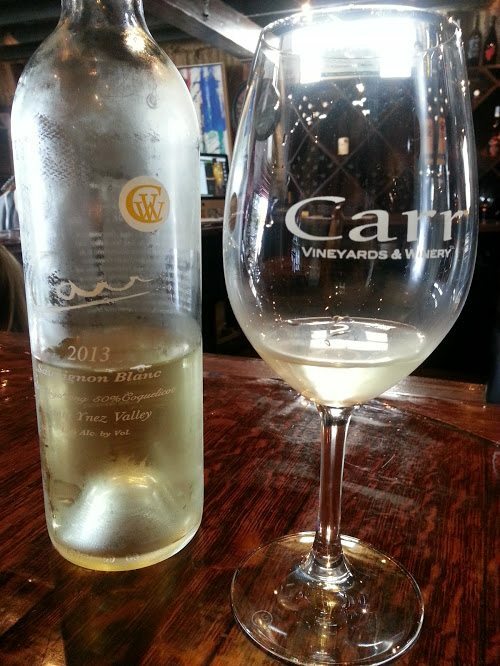 I chose to visit Carr Vineyard and Winery because I was not familiar with them. Their winery is just outside the Santa Barbara “Funk Zone.” They have two tasting rooms – one in the winery and one in the center of town. From Santa Ynez Valley. Soft. Dry. Light bodied. Good acidity. This is a good fish wine. Pinot Gris 2013: From Sta. Rita Hills. Floral nose. Velvety mouth. Not as pungent as some other pinot gris. Medium to full bodied. Lingers softly. Pinot Noir 2011: From Sta. Rita Hills. This is a winner. Medium to full bodied. Has a great nose of plums and cherries. In the mouth, the flavors are earthy and sweet. A strong finish. I regret not buying a bottle of this wine. Sangiovese: A wonderful bouquet. Very robust in the mouth. Finishes strong. A little too strong for my taste, but it is still enjoyable. It would go great with a spaghetti dinner. Syrah 2011: From Santa Barbara County. A sweet syrah. The sweetness is not as noticeable on the nose but very prominent in the mouth. Full bodied. 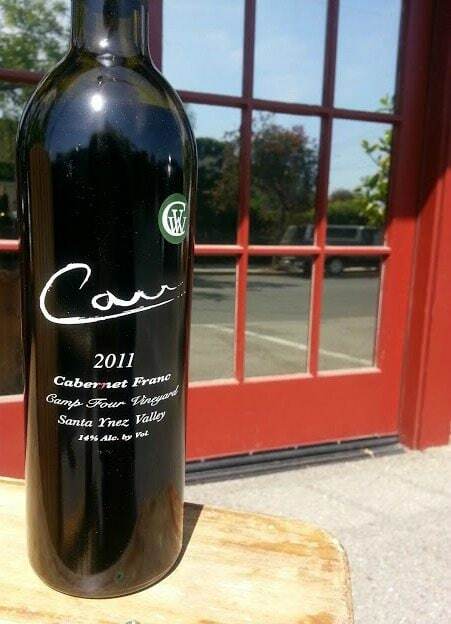 Cabernet Franc 2011: From Santa Ynez Valley. Of all the wines I tasted, this was my favorite. I even purchased a bottle to take home with me. There’s a spicy note on the bouquet and deep in the mouth. However, the sweetness balances out the spice. A very well-structured wine with a bold finish. You can easily see the complexity. I would pair this with a hearty meat dish – Mexican beef tamales or even a Korean bulgogi. Looks awesome! Can’t wait to make our way up there! What a lovely winery – I hope we can visit someday!